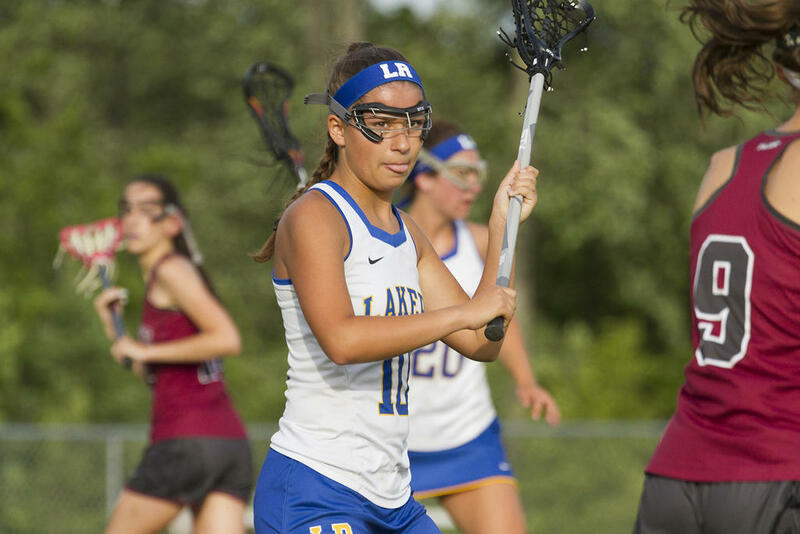 NAPLES—Lake Region tamed the Panthers with relative ease on Friday, June 8, tranquilizing them 19-6: Lakers Lindsey Keenan and Melissa Bonenfant turned in a hat trick apiece in the winning effort, and the team advanced to Tuesday the 12th’s Regional Final. LRHS hosted Freeport for that contest, and though the action seesawed through much of the first half, the Lakers began to pull away as the break approached, and won in the end 19-8. Rachel Shanks led the scoring with five goals. Lake Region will next face off on Friday night, June 15, when they meet St. Dominic in the State Championship. The Lakers seized the lead early against the Panthers, and zipped ever forward from there. As mentioned, Lindsey Keenan and Bonenfant tallied three goals each for LRHS; Keenan logged an assist as well. Lauren Jakobs, Paige Davis, Shanks, Bella Russo and Mackenzie Siebert hashed two apiece, with Jakobs and Shanks also kicking in one assist each. Finally, Shauna Hancock had one goal and one assist, and Aisley Sturk and Isabelle Davis-White had one goal per girl. Lake Region blew the Panthers out – but it’s not entirely fair to say the Panthers played poorly; the Lakers just played really well. Bella MacMahon contributed a hat trick for NYA, while Natalie Farrell added two and Tessa Quattrucci added one. The Lakers first faced off with the Panthers this spring early in the regular season. Lake Region dominated that bout too, winning 17-5, but that result actually worked against them in a way, this second time around. Freeport won the opening draw in Tuesday evening’s Regional Final, and wasted little time – 48 seconds, to be precise – in scoring the game’s first goal. Taylor Dostie did the honors, with Lakers keeper Maddie Nelson initially blocking the shot in the grass, only to watch it trickle past her feet and in. Two minutes later, Lake Region responded: Lindsey Keenan, carrying, couldn’t get the shot she wanted, ducked behind the Freeport net and dished to Hancock in front. Hancock redirected low past Falcons keeper Cam Pasquale. 1-1. “[We knew Freeport was] a very strong team that seemed to be getting better each week,” Coach Keenan said, asked about his girls’ opposition in the Regional Final. The teams continued their thrust-and-parry through much of the first half: Bonenfant scored for Lake Region on a Shanks assist; Taylor Rinaldi scored for Freeport with help from Chloe Davidson; Dostie struck again (assist by Rinaldi). Finally, one team seemed to seize a little momentum: Rinaldi struck again for Freeport, this time on a rebound – Nelson turned in a spectacular first save, but couldn’t rake the ball in for control, and Rinaldi pounced. The Falcons’ momentum proved illusory, though, as the Lakers notched the next two – one by Shanks (from Lindsey Keenan) and one by Jakobs (barely 11 seconds later, directly off the draw) – balanced the scoreboard. Siebert and Freeport’s Margaret Perrotta then traded blows for 5-5. That, however, is where things started to go entirely wrong for the Falcons, and entirely right for the Lakers: Shanks, Bonenfant and Lindsey Keenan tallied rapid-fire, shunting LRHS out front 8-5 and assuming thorough command of the action. 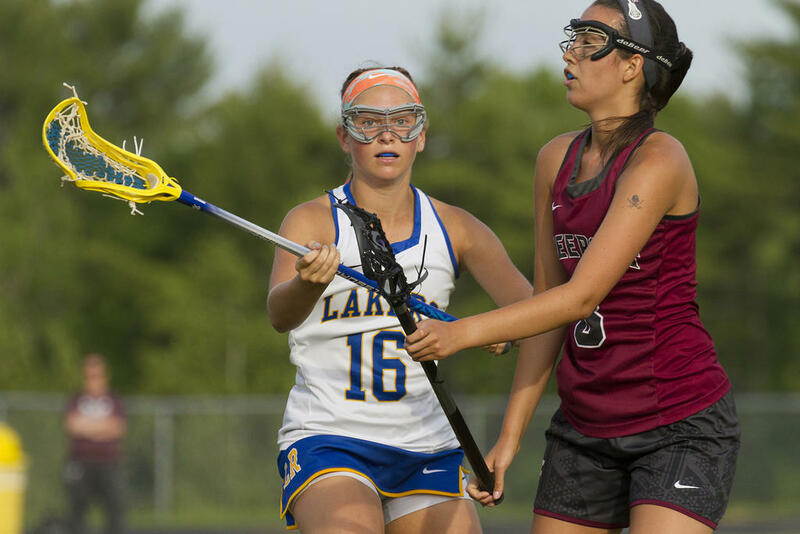 By the break, Lake Region had heaped up a 10-6 advantage – one they continued to build on in the downhill minutes, when they outpaced Freeport 9-2. For the Lakers, Shanks finished the evening with five goals and three assists, Lindsey Keenan with four goals and six assists, Bonenfant with four and two. Siebert added a hat trick, and Jakobs two. For the Falcons, Rinaldi concluded the outing with four goals and one assist. Dostie picked up two goals and one assist, total, and Perrotta a pair of goals. Davidson finished with a pair of assists. Freeport retires for the year at 9-5; Lake Region bumps to 12-2. Hailey Parsons defends for the Lakers. Laker Paige Davis hounds a Freeport opponent. Aisley Sturk tracks the action for LRHS. Lakers Lauren Jakobs (left) and Paige Davis (right) converge on Falcon Paige Rinaldi, attacking. Olivia Deschenes breaks out for the Lakers. LRHS netminder Maddie Nelson defends. LRHS head coach Dave Keenan debriefs his girls following their huge win over NYA. Hailey Parsons duels with a Panthers opponent. 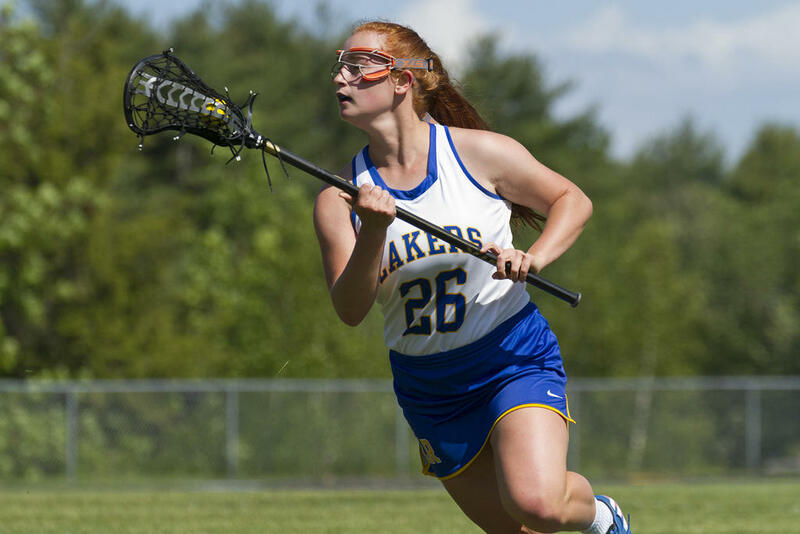 Isabelle Davis-White added one goal in the Lakers’ win vs. NYA. 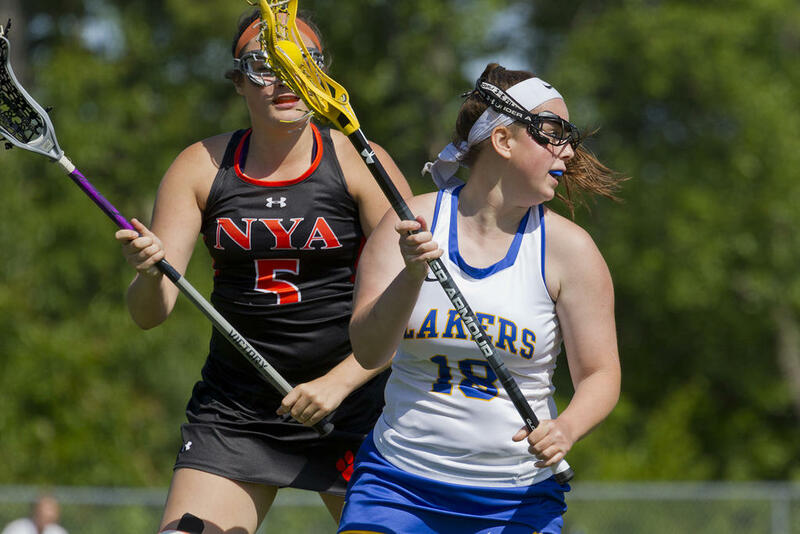 Paige Davis kicked in a pair of goals for the Lakers in their easy victory vs. NYA. Laker Emma Brown carries on the attack vs. NYA. Shauna Hancock pushes inward on the attack for LRHS. Lindsey Keenan curls away from a NYA opponent; Keenan contributed a hat trick in the game. Bella Russo cuts forward on the attack for LRHS in their win over NYA. Mackenzie Siebert chases after a Freeport attacker.